Tail of the Dragon Tips? 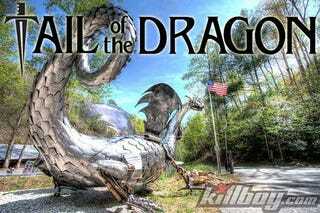 I’m heading to the Tail of the Dragon in a week for two days of twisty road activity. I’m driving my GTI and meeting up with two motorcyclists. Any tips from the Opposphere? I’m already figuring on bringing some minor foodstuffs, since we’re staying in Deal’s Gap and there are about four non-fast food restaurants in Robbinsville, from what I can see. And little else nearby. I’m also going to visit Joyce Kilmer Memorial Forest because it is a rare, un-logged forest nearby that many have recommended. We also have been debating whether I’m the chase car for them, or if it is better for me to clear a path. Or just all do our own things with a plan to meet up at a given time and place. So, other than to set the DCC to “Sport” and avoid contributing a part to the part tree (especially since my car is leaving the body shop just today) . . . any ways to make the trip better?